Diamond carat size is one of those things which, although actually quite simple in concept, does cause some confusion. Many confuse the definition of carat size, and many don’t understand that the other 3Cs can also have a marked effect on the price. Important: When we talk about the “size” of a diamond, we’re really talking about the weight, as measured in carats. All diamonds, regardless of the cut and color, are almost exactly identical in their physical make-up. The carat weight, color, clarity and quality of the cut help determine the grade of the diamond. The finer the stone, the more it’s worth. The measurement unit of carats is actually an ancient unit of mass, rather than weight. Seeds of the carob tree were always used to weigh gold and, from the early 16th century, diamonds. Diamond traders used carat weight because they believed – wrongly as it turned out – that all seeds were identical in size and weight. In 1907, the General Conference on Weights and Measures standardized the carat weight at 200mg. It has since become the official metric used when buying diamonds. When weighed on a metric scale a 1.00 carat diamond weighs 200mg and a 2 carat diamond weighs 400mg. Another way to measure diamond weight is in “grains” (based on wheat-grains). 4 grains equals 1 carat. When you buy most commodities by weight, 2 units will usually give you twice as much as 1 unit and, although the same is true of diamonds, there is something akin to an iceberg principle at play. As an example, with modern round brilliant cut diamonds (although this similar principle applies to all cuts), a 1 carat diamond will be 6.4mm across the widest point, and a 2 carat will be 8.1mm across, not 12.8mm as might be expected. See example above. In other words, the 2 carat diamond is twice as heavy, even though it won’t appear to be twice as big. When setting the 2 carat diamond in a ring, it won’t appear to be much larger than the 1 carat diamond. You will only see a surface area increase of approximately 25-26% over the 1 carat diamond. These dimensions will vary depending on the type of cut and the corresponding crown area size. So, as we said above, when saying “size” in relation to diamonds, we really mean ”weight”, as opposed to visible size. Visible size is a major factor in the appeal of a diamond, though, the progression in size isn’t as pronounced as expected. This confusion between weight and visible size is the biggest cause of confusion, and often concern, among people browsing for an engagement ring or other jewelry which contains diamonds. You’re not getting less diamond, you’re just seeing less of what you pay for. According to the Diamond Carat Size Guide for round brilliant diamonds, a 0.25ct diamond should be 4.1mm across, and a 0.5ct diamond 5.1mm, a clear difference of 1.0mm. However, a 1.25ct diamond should be 6.9mm, and a 1.5ct diamond (an identical 0.25ct increase) 7.4mm, a difference of just 0.5mm, or half of the difference for the smaller diamonds. This is despite broadly similar percentage differences in visible size for all the diamonds. If the above math was too confusing, here is a chart that breaks it down. Please note that the diamonds are not perfectly to scale. When shopping at the store, buying a large box of cereal is generally a lot less expensive than buying two small boxes. Diamonds operate in exactly the opposite way. One large diamond is worth far more than two smaller diamonds, even if their combined weight is the same. Below is a chart* for the price jump of a J color and VS2 clarity round diamond as the carat size gets bigger. As the diamonds get bigger, they get progressively rarer, and so their price goes up dramatically. A diamond that measures twice the size of another will cost many times the price. In order for the price to go up, all the other pricing variables will need to be kept the same. *The prices above are accurate as of October 2017. The size of the diamond as it appears on a hand won’t only depend on the carat size of the diamond. The size of the finger, the design of the ring, the cut of the diamond and the height of the setting will all impact the perceived size of the diamond. 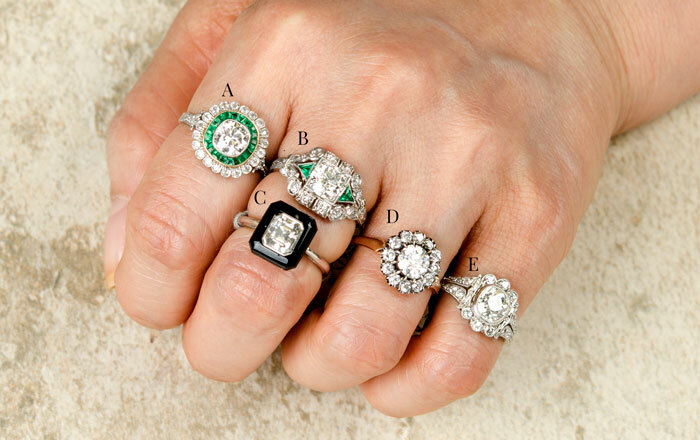 Here is a list of the center diamond weight of the rings shown in the picture above. To see more pictures of different sized rings on a finger, click here. Sellers always bundle the prices for diamonds within 0.50 carat intervals. What this means is that a 0.95ct diamond will usually cost almost the same as one at 0.51ct, and yet be visibly indistinguishable in size from a 1.00ct diamond. A savvy buyer should take advantage of this information and choose carat size carefully. Of course, this technique works the same in reverse as well. If you do eventually come to sell the ring, don’t expect more than the 0.50ct price for your 0.95ct diamond. Assuming that you want to have a budget in mind, here are the tips that you can use to ensure that you get the largest diamond. Find a diamond that falls at the top of 0.50 carat interval, like 0.98 carats or 2.49 carats. See our comments above. Find a larger diamond and sacrifice on the clarity, cut quality or color. Most buyers would rather a few slight inclusions than a smaller diamond. Buy a diamond with florescence. Ask the jeweler to build a mounting with a halo around the center diamond. The halo will make the center diamond appear larger. Risky advice: Find a shallower diamond. Although the diamond will have a lot less brilliance, the spread will be a lot larger. Buying diamonds involves a combination of many things, of which weight and visible size are but two. Take some time to get an idea of what the 4Cs are, and how they each can affect the price of an individual diamond. Then start to consider the visible diamond carat size, and how it may look on your finger. It may well be that the actual weight becomes less important if everything else falls into place for you. Buying your diamond will be one of the biggest milestones in your life. The diamond is something that you intend to keep forever. Make sure you do enough research before you take the plunge.